This 3-2 Cabin with Ski Slope Views Sleeps 10 for Just $130 a Night! You'll never find such an amazing Big Bear cabin with this jaw-dropping view. It sleeps up to 10 guests for only $130 a night. That's 13 bucks per person! This ideal Big Bear mountain retreat has been discovered by countless Southern California travelers as well as others from Arizona and Nevada. Get your full family together or a bunch of your best friends to enjoy that beautiful view of the southern mountain range when eating or relaxing on the large deck. Below you are miles of pine trees without another structure in sight. No wonder you know you are in the middle of the forest -- Whispering Forest to be exact, the appropriate name for this very private section of Big Bear. Scan the more-than 100 reviews of the cabin and read how impressed our previous guests have been with their accommodations. The owner is also ranked a Vrbo premier partner because of his quick response to any request you may have while you are his guests. He lives only 10 minutes from the cabin, so if you can't figure out how to operate the television or DVR controls, or can't find a utensil you need, he'll be over in the flash. His home seems to have at least two of everything. Though located in a pristine section of Big Bear, far from bustling crowds, it is within a short drive to our main attractions. The National Forest is about 500 feet from the front door. But because it isn't shown on any local map, you can hike up to see inspiring views of the lake and never another living soul, only rabbits and squirrels that will scamper away as soon as they hear your approaching footsteps. Though located at the top of a ridge road, you a 10-minute drive to the to the center of Big Bear Village with its many mom and pop shops and dozens of restaurants. But most guests prefer to eat in the cabin, where a fully-stocked kitchen has everything you will need -- even a full range of many spices and an array of pots, pans and appliances not found in other rental cabins. And appliances? There's a microwave, a blender, even a slow cooker that will fill the dining area and great room with the smell of a simmering stew. As you drive your vehicle up the gentle curves of Eagle Mountain Road, a turn to the left near the top of the mountain takes you to Green Mountain Drive. The view from this ridge road has been described as breath-taking by guests as soon as they open the front door. Near the end of the road you will find the Almost-to-Heaven Hideaway. You will never hear the sound of a passing car, only the sounds of squirrels scampering above the faulted ceilings, or a gentle breeze whistling through the surrounding pine trees. The lake may be 7,000 feet above sea level, but here in the Whispering Forest, the hideaway is another 1,000 feet closer to heaven -- hence its name. Almost-to-Heaven Hideaway provides the rustic atmosphere guests seek in a mountain home, but also offers the conveniences one expects while on vacation. Tucked behind shuttered doors in the hallway closet is a washer and dryer. In addition to its custom stone fireplace, the great room contains a large-screen television, a DVD player and a massive varnished log slab breakfast bar that lets the chef enjoy the inspiring view while preparing a meal. That spectacular 180-degree view of both the Bear Mountain and Snow Summit peaks can be seen from the great room and master bedroom, while the two bedrooms on the lower level offer forest views. The entire south wall of the main floor is composed of sliding glass doors, filling the cabin with light. Adjacent to the great room is the vaulted master suite containing a queen oak sleigh bed; a large, mirrored walk-in cedar closet; plus a second flat-screen television and DVD player. Downstairs the other two bedrooms are separated by the second bath. One bedroom contains a queen iron bed and the other holds a set of full bunk beds that can accommodate two adult couples or four giggling youngsters. There’s a fenced back yard if you want your pups to get some outdoor exercise, and there is no additional pet deposit. It's time for you to leave that hum-drum life you lead at the bottom of the mountain and come up to the clean air you will find 8,000 feet above sea level. You'll be glad you did. Hope to see you soon. I once worked full-time in Orange County as an instructor at a private school where I helped students through courses such as property management and real estate, helping them prepare for the California Real Estate License Exam. One student, very grateful after passing the state test, invited me to the town of Big Bear in the San Bernardino Mountains. I fell in love with the quiet peacefulness of the community, and vowed to move there following retirement. But once here, my background in real estate made me forget retiring; instead I began to invest in vacation rental cabins, renovating them to appeal to visitors from throughout Southern California. We call our cabin the Almost-to-Heaven Hideaway. Guests understand when they drive up a gently winding road to the structure's location high above the town of Big Bear. Even though I saw the property required renovations, the view took my breath away as soon as we were inside. The cabin is also located in a wonderful section of Big Bear known as Whispering Forest. It sits on the edge of the National Forest, where guests can take hikes in summer and sled in the winter. 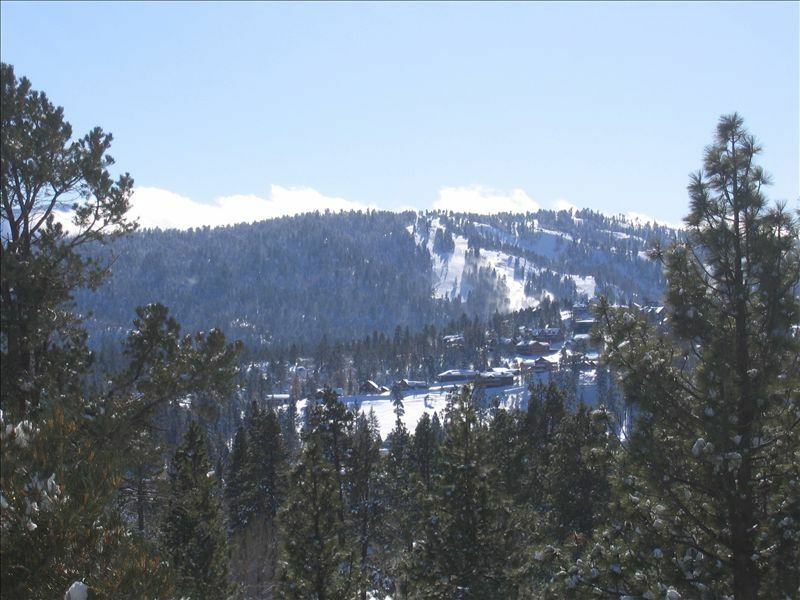 While away from the bustle of Big Bear, it is just a 10-to-15-minute drive to all of Big Bear’s main attractions. My two grandsons (pictured here) are drawn from the east coast to Big Bear with my daughter, where they can ski and snowboard in winter, or enjoy beautiful Big Bear Lake in summer. Many of the unique benefits of this marvelous cabin are mentioned above. Yet also impressive is the large great room, composed of the living area, kitchen and dining room table. The outstanding view can also be enjoyed from the all these sections of the great room, as well as the master suite on the main level of the cabin. On the lower level, there are two nice-sized rooms, as well as a full bath that separate them. The cabin has been enjoyed by large families and groups as evidenced by the numerous glowing reviews that make the property a five-star favorite for many returning guests. The back deck, which extends across the entire width of the cabin, is an ideal location for BBQs, tranquility, enjoying the beauty of the forest and breath-taking views. There's a glass-top table, plenty of chairs for everyone to relax. Just a short 10-minute drive from the cabin, the village offers a wide assortment of mom-and-pop stores, plus an assortment of restaurants. There's a peek-a-boo lake view from the west end of the master bedroom and back deck showing that it's just a five-minute drive to the north shore boat launch. This mountain view is BIG, some 180-degrees of pine-covered hills that also include the area's two ski resorts. The heating system is gas that is easy controlled by a thermostat. In addition, there are room heaters in the lower bedrooms to make you feel cozy at night. Professionally cleaned between all bookings, additional bath and kitchen supplies are also provided. The new stackable washer and dryer is located in the hallway closet behind shuttered doors. The custom-built, floor-to-ceiling fireplace is constructed of native stone. The driveway for the cabin is large enough to hold three cars. Towels, hand towels and wash clothes are more than most rental cabins provide. The living room is really a great room that can seat all members of your family or group. The dining table has room for seven people, and a breakfast bar provides room for three more. The large-capacity Kenmore refrigerator is brand new, and contains an ice-maker. This is another new addition to the kitchen to make it easier to prepare meals or warm up quick snacks. Everything is here that you will need. If you can think of anything else, just call us We live 10 minutes away and can bring it right over. The vaulted kitchen is part of the great room, allowing the chef to take part in family activities while preparing meals. There is a new, large-capacity refrigerator with an ice-maker, a dishwasher, and a built-in microwave above the gas stove. A new coffee-maker, 4-slice toaster and blender are also provided. (2) There are two televisions, a large-screen in the great room, and a TV in the master bedroom. There are DVD players in the great room and master bedroom. There are a number of hard-back books that guests can enjoy during their stay. The deck extends across the entire back of the cabin with amazing views. There is a total of five wooden Adirondack chairs, plus a wrought iron table set for outdoor gatherings. The local ski slopes and snowboard runs are about a 15-minute drive from the cabin. Vaulted T&G wood ceilings supported by massive beams in the great room and master bedroom; real wood blinds and custom drapes; most kitchen appliances, as well as the washer/dryer, are brand new; oil paintings, prints and historical photographs of early Big Bear add to the ambiance of all rooms; rustic light fixtures and many antique wood furnishings make this an impressive mountain retreat. The view was beautiful! David’s home is nice and liked that the backyard was fenced for our dogs. We enjoyed this very peaceful cabin in the mountain. It was the perfect weekend retreat for our family. We will be back someday! Beautiful Cabin with a wonderful view. Stayed at Big Bear with family and we had a wonderful time. The cabin is very spacious and cozy. The view is beautiful. You have everything you need in the cabin. David was a very nice host. Would definitely stay there again. BEAUTIFUL! Amazing Cabin, very family friendly! We loved everything about our stay. Very spacious and well equipped cabin. Our host sent us plenty if instructions and information far in advance, which made it easier for us to arrive safely. We will definitely be staying here again. . Thanks Again!!! Thank you David for allowing us to stay in your home. We had everything we needed. Beautiful view we woke up to every morning. Perfect place for a family getaway. And just minutes from town. We will definitely be back! Maybe in the spring this time! The cabin is in a nice quiet neighborhood with an amazing view. David is a great host and very helpful if you have any questions. We will absolutely rent this cabin again! The cabin is located about a two-minute walk from the end of the road, which culminates in the San Bernardino National Forest. A sign coming up Eagle Mountain Drive to the cabin states 'No through access,' so those in search of scenic views of the lake or hiking trails turn around and never reach our cabin. As a result, this is one of the most quiet, peaceful sections of Big Bear's Whispering Forest that lives up to its name. You will be rewarded with plenty of lake AND mountain views after another three-minute walk into the forest. It's a slow, easy incline to higher elevations that makes a perfect hike for beginners. The more adventurous and experienced hikers can continue to find large boulder outcroppings that are perfect for gazing at the endless view. Since you won't find mention of this section of the forest in any of the guide books, it is extremely doubtful that you will encounter any other human being during your experience with nature. Please contact the owner through this site, or call our toll-free 888-424-5211 number to obtain our holiday rates, seasonal rates, or any discounts available.